Tooth Fairy is still in a recession! As many know, the Tooth Fairy visits our office frequently, mostly due to the fact that we see many children that lose their baby teeth. We sometimes get asked about the fee that a Tooth Fairy should leave under the pillow. Well….according to this article that fee is decreasing? This is despite the fact that the stock market has been up for the past few years! May be the Tooth Fairy needs some investment advice? 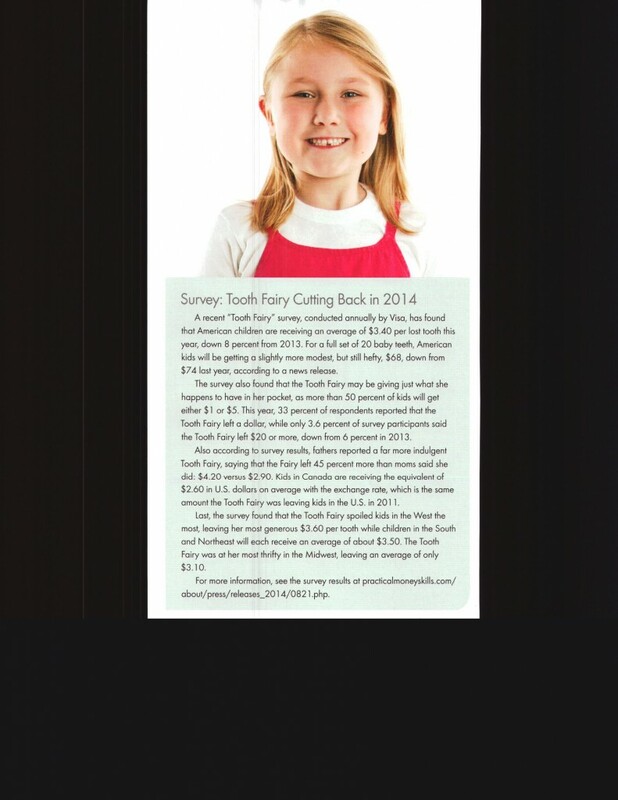 In a recent article in the CDA, they noted that the “Tooth Fairy” was a bit more cheap in 2014. On average children received $3.40 per tooth lost, down 8% from the previous year. Below is the actual article and reference. Interesting stuff! At what age should I brush my childs teeth?